Cambridge is a man-made precast fireplace resembling a natural smooth beige stone. GFRC is a lightweight option making it easy to install. A great remodeling option. A contemporary design with fluted pilasters and an arched opening. Inner panels come right up to the brick opening. 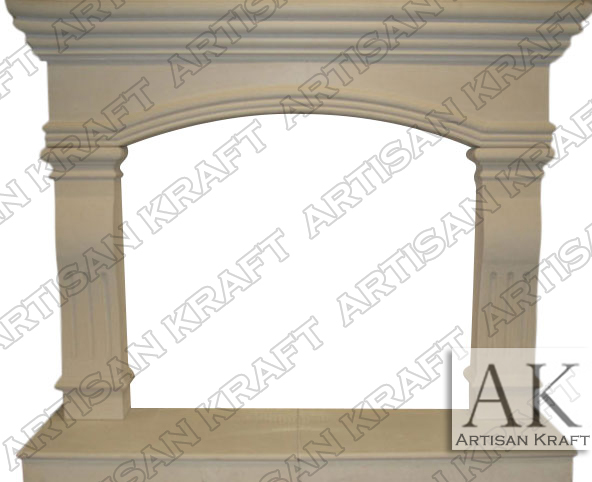 This mantel can be made with corbel legs as pictured or with squared pilaster legs. Typical Dimensions: 66″ wide x 50″ high *can be made to custom dimensions. Stone: Limestone, GFRC, sandstone, marble, travertine etc. Available in many different colors, textures and finishes. *Raised hearth additional. Additional charges may apply for colors, stone, size and finishes.